Bluffing is a vital ingredient to playing the most popular card game in the world; poker, and this article is centred on bluffing in the most popular format of poker played around the globe; Texas Hold’em. The bluff is far too regularly overused and mistreated by many players, resulting in heavy chip loses – the more it is used the less effective it becomes. The art of deceiving your opponents must be understood in its full extent, and needs to be carried out with caution. Bluffing wisely and at the right time will add an element of unpredictability to your game, allow you to win more hands, and make it difficult for other players to get a good read on how you play. Even the use of word ‘bluffing’ is thrown around like an old TV guide. There is much more to this fine art-form than many players would believe – in the most basic form, yes, to bluff or deceive opponents in poker is to make them believe you have a better hand than they do, when in fact you do not. But bluffing runs much deeper than that explanation. 1/ The pure bluff: the most clichéd bluff of all, the pure bluff (also known as the naked bluff), is when you move your chips all-in, or make a significantly large bet, with a ‘nothing’ hand, in the hope of scaring all other players in to folding. This bluff is used all too frequently by beginners to intermediates as a defensive/last resort move. And unless you can read your opponent extremely well, this move is very dangerous as you risk all or most of your stack with a hand which will most likely be beaten if an opponent calls you. 2/ The continuation bet (c-bet): this type of bluff starts pre-flop and is one of the more common betting styles used in Texas Hold’em – you raised last pre-flop (done with a medium to strong hand), and then miss the flop but still bet. This gives you control of the hand and creates a good chance your opponent/s will fold. Always use the flop to decide whether you should c-bet – for example, if you have an Ace of Diamonds and a Queen of Hearts and the flop shows King (Clubs), Three (Hearts) and Five (Spades), unless your opponent has a pair of Kings, it will be difficult for that player to call your c-bet. If you get called and c-bet the turn, this is known as double-barrelling, and c-betting the river is called triple-barrelling. 3/ The semi-bluff: the semi-bluff holds less risk than the pure bluff, and is when you bet large or raise on a hand with value, but one that hasn’t hit anything yet (the semi-bluff can be used as a c-bet, but doesn’t have to be). For instance, the flop shows a Nine (Spades), a Queen (Diamonds) and a Four (Spades), and you hold a 10 and Jack of Spades. Placing a large wager here is considered a semi-bluff because you are behind anyone with as little as low pair, but have ‘outs’ that would give you the stronger hand. Semi-bluffs are usually made if a hand has outs such as over cards (cards that will make a higher pair than any already on the board), straight or flush draws, or a combination of these as seen in the above example. If your opponent/s fold/s, you buy the pot successfully, otherwise if your opponent/s call/s, you still have a good chance of improving your hand and winning. 4/ The check-raise: this type of bluff, when used effectively, can be very profitable. Here, you slow-play a strong hand by checking when out of position (not on the button), such as three-of-a-kind, hopeful your opponent/s will bet so you can then raise – this type of play should be done later on in the round so as not to reveal too much information about your hand. The bluff-raise is played the same way as the check-raise, however here you are check-raising a weak hand out of position in the hope your opponent/s will fold so you can buy the pot (much greater risk involved). 5/ The post-oak bluff: this is a more advanced bluff and needs to be used based on how you have read the entire hand thus far. The post-oak bluff is when you place a small-value bet on the river with a weak hand, in anticipation that your opponent/s will think you’ve hit a very strong hand (better than theirs), that you want to be called, and forcing them/him/her in to a fold. This is high-risk, high-reward play; you must be confident enough with this bluff that your opponent/s read your hand as strong, so as not to call or even raise your bet. 6/ The quick bluff: this bluff is intended to finish the round regardless of your hand, and is played early on when on the button, most often directly after the flop. For instance, the flop shows two Nines (Diamonds and Clubs) and a Four (Hearts), the two players before you have checked and you now place a small-value bet intended to scare them away. In this scenario, it is most likely either no-one has hit anything, or someone has a Nine and is hoping another player bets (slow-playing). If neither player has the Nine, chances are both will fold and you will take down the pot. If you are raised, consider your next move carefully. Being in position (on the button) always provides you with more information about your opponents’ hands and how they play. Acting last increases your chances of a successful bluff, as you’ll be able to tell whether your opponents are playing weakly or strongly. If everyone has checked, you are in a stronger position to bluff – this likely will get rid of a few players, but not all; players may call just to keep the round going. If you find yourself up against a tight player who folds easily, you can take advantage of his/her weak play by throwing in a bluff now and then – these players are best to target, and betting against them will often yield information about their hand. Betting simply to garner information about how others play can also be very effective in the long run. It is less risky to bluff at smaller pots than larger pots; if you get called you aren’t risking as much. The best bluff is one which has a relatively good chance of winning anyway (has a number of ‘outs’) if it does get called. Against one other player, a continuation bet can be very effective – two out of three times your opponent will miss the flop, so if you raised pre-flop, betting after the flop can be profitable. 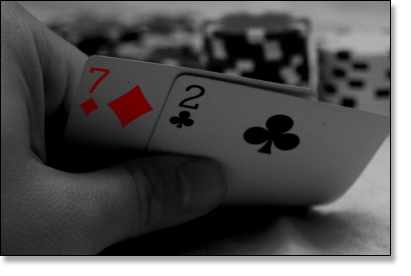 Continuation betting is often used as a key tactic in online poker. Remember, good players will also be aware of different types of bluffs and attempt to counter them if they feel they can push you out, so as always, take caution. Bluffing should not be used a game-plan. All pun intended, bluffing should be considered a screw driver (because you want to screw players) which assists in the building of an entire house… a.k.a, a full house. See how your game stacks up against other online players a www.888poker.com – play instantly via your desktop, or download the software directly on to your hard-drive. Most importantly, you can practice first before trying your hand at real money.